The advise-and-assist mission for U.S. troops in Iraq is expanding after a small team of American forces deployed for the first time to work alongside an Iraqi battalion and help install a bridge over the Tigris River south of Mosul, U.S. defense officials said. The weeklong mission of engineers in late July was disclosed publicly for the first time on Wednesday. The bridge will provide the Iraqis with a vital ground link to the military airfield known as Qayyarah West, which will play a key role in the imminent attack on Mosul. U.S. troops were previously restricted to the Iraqis' division-level headquarters. But in April, President Obama for the first time authorized U.S. combat advisers to deploy with Iraq army forces at lower levels, including brigade and battalion headquarters. However, those deployments did not begin immediately and U.S. military officials said the expanded authorization would be used only for critical missions. "This mission … demonstrates how we could selectively use this authority in future operations," said Army Col. Christopher Garver, a Defense Department spokesman in Baghdad. U.S. military officials said the expanded advise-and-assist mission was necessary and would allow those Americans to be more effective. The deployments also pose a greater risk by putting those troops closer to combat operations against Islamic State militants, also known as ISIS or ISIL. Garver said the bridge is a big step in preparing to attack the ISIS stronghold of Mosul by linking the Iraqi army's main logistics hub in the Kurdish-controlled town of Makhmur to the forward-operating base and airfield at Qayyarah. "Connecting Qayyarah West air base and Makhmur will greatly improve maneuverability and shorten lines of communication for the [Iraqi Security Forces] as they prepare for the eventual assault to liberate Mosul," Garver said. Army Col. Christopher Garver, Operation Inherent Resolve spokesman, briefs reporters via teleconference from Baghdad on operations targeting the Islamic State of Iraq and the Levant, July 27, 2016. U.S. troops have deployed beyond division headquarters for some missions with the Kurdish peshmerga and with Iraqi special forces units, but the mission to install the bridge was the first time in years that Americans have directly supported a conventional Iraqi army battalion, Garver said. 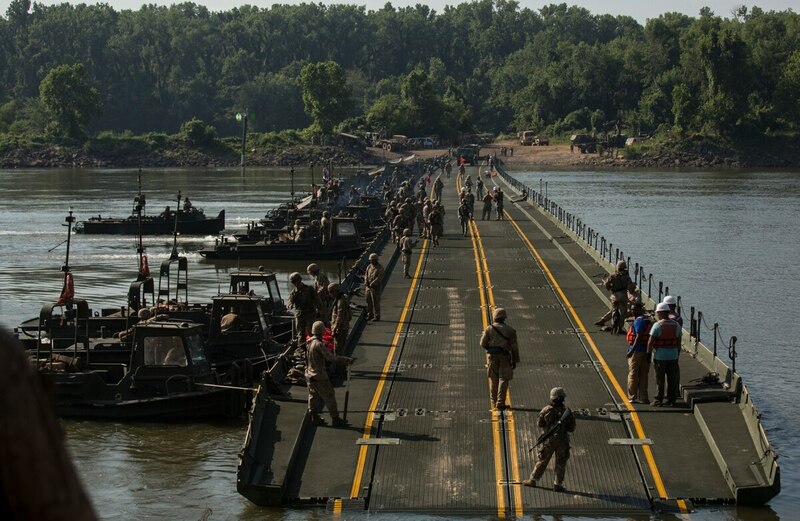 The Iraqis first secured the bridge across the river July 15 after an initial attempt July 13 was halted amid enemy fire, Garver said. The team of American military engineers showed up July 20 and spent about a week working alongside Iraqis and "providing advice on those protective measures to better secure the bridge," Garver said. The team of Americans worked at the site of the bridge during the day but returned at night to a secure American base at Makhmur, Garver said. There are about 4,100 U.S. troops authorized to deploy to Iraq. Top commanders say additional troops may be necessary for the final invasion of Mosul, which may begin later this year.